EAI Information Systems’ brand mark is the Ghanaian symbol for “quality” and “persistence.” Founder and CEO Matt Essieh attributes the success of his entrepreneurial venture to those important values. In 1989, he decided to merge his experience in banking and financial service with a solid understanding of information technology. Matt Essieh, CEO and Founder , EAI Information Systems Inc. The result: robust and scalable software and systems that address the needs of leading regional and national banks. Since its launch, EAI Information Systems has grown its client base to include a multitude of financial institutions nationwide. The company supports banks with assets ranging from $1 billion to $1 trillion, including some of the nation’s leading retail banks, broker-dealers, investment firms and insurance companies. Essieh, who holds an MBA degree from Southern Oregon State University, employs 22 staff members in EAI’s headquarters in Beaverton. He is active in many civic organizations and is Chairman of the board at Harambee Centre, a nonprofit organization focused on multicultural education, cross-cultural exchange and African community development. At a recent interview, Essieh shared his vision for the company and passion for philanthropy. 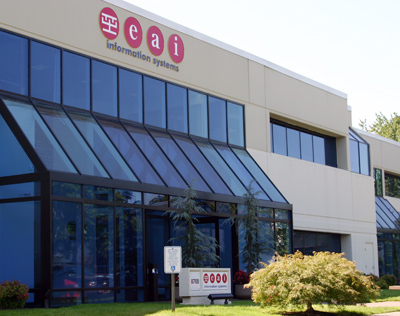 What gave you your vision to start EAI Information Systems? We saw a need in the financial services industry – particularly in banks – for technology that will allow them to serve a wider range of financial services products. Banks usually do loans, checking accounts and CDs (certificates of deposit), but our technology allows them to include stocks, bonds, insurance and mutual funds. It was also a fulfillment of my own childhood to start my own business. I’m originally from Ghana and came here to go to college. I worked at a bank following my graduation, and I’ve been in the banking industry ever since. What do you consider as some of the early successes for your firm? We’re lucky to be one of the first companies to identify this need. The industry was changing. Because of new regulations, banks could sell mutual funds and stocks. We were one of the first ones to see the need for technology that would allow them to do that. We were also very lucky to land a reputable regional bank as a client. So those two factors were critical to our success. What sets EAI apart from the competition? We’re able to align product development and strategic plans closely with the evolving and changing needs of our clients. Instead of developing a product and hoping that someone will buy it, our approach is to work closely with the client to get their input in developing a product that meets their needs. We value our clients’ feedback and input about our own strategic plan as a company. As an organization, we’re able to create an environment and culture that encourages ideas and creativity. Our goal is to make our employees want to be here for the long-term. We have a very diverse workforce, and our people are respected for their contributions and valued for the ideas they bring to the table. What qualities make a successful entrepreneur? Being honest and working hard to make sure that people trust you. You have to have determination and persistence, because there are sure to be bums along the way—you need to be able to stick it out. The other important characteristic is being able to see problems as opportunities, to grow and be creative. Most important of all, you have to be able to manage with an eye toward the bottom line. The business has to be a rock, financially. Sometimes entrepreneurs get carried away with dreams, but often don’t have a business model behind it. That’s really tough for many business owners who are just starting out – making sure that the money is the driver behind their efforts. Here again comes the importance of aligning your goals closely with the needs of the client. Our products are customizable and flexible to our clients’ needs. How does your cultural background impact the way you conduct business? The values I learned growing up in a small town in Ghana definitely impacts the way I do business. Everybody knew everybody, so honesty is important. It’s also important to appreciate the unique gifts and talents that every individual brings to the team. We look beyond the façade to identify and appreciate that everybody has a gift to the company, in terms of skills. What are some of the things you look for when you’re bringing people in to EAI? When we’re looking to hire people, we hope that this will be a long-term career decision for them. They have to be able to do whatever it takes to address the customer’s needs. Somebody with a creative approach and enthusiastic enough to contribute to the positive culture that we have here. What do you consider as the most challenging aspect of running your own business? Balancing all of the different areas that make the business successful. You have to keep an eye on the changing nature of the industry: make sure you’re coming up with a product that people want. We’ve been really good at managing the financial side of the business. Technology changes so quickly, so it’s important to try to always stay a bit ahead, and effectively manage research and development activities. For a small company that may not have all the skills in place. We’ve been around long enough now, that we’ve brought people along to take responsibility of all the different areas. How did having an MBA degree impact your business? I wanted to have as much education as possible. Education is not the only thing, of course, but it has provided a solid foundation. Business education opened my mind to view things in a broader scale. I combined my education with my own determination and persistence. It has helped me to look at the business from different functions: finance, marketing, sales, operations. For example, when evaluating a product, we’re not only looking at it from a technology or engineering perspective; it also has to make business sense. What is your vision for the organization? My vision is really simple: we want to be the trusted technology partner for our clients. We also want to be an organization that has the culture for continuous improvement: one that encourages ideas and creativity. Products and business needs change all the time. But if we are able to engender trust from our clients, and our staff sees that this is a place where they can grow professionally, then we’ll be successful for the long-term. Your emphasis on making sure that your staff sees EAI as a long-term career commitment is refreshing, especially when you see companies implementing layoffs left and right. I take my responsibility as CEO seriously. Our clients are entrusting their money with us, and our staff are entrusting their time here. So the responsibility I have is to make sure that the business runs well, for our staff and clients. I’m proud to say that during the dotcom bust, I didn’t have to lay off a single person. We have our staff’s interest at heart, and we make sure that we manage the business properly. What important trends do you see in the industry? Technology is making it possible for customer information to be aggregated in one place. This is information that used to be in disparate locations, in different financial institutions. For a financial institution to be successful in retaining customers and building a lasting relationship with the client, they have to be able to tap into that information to know the customer better than their competitor. By knowing the customer better, you can develop the right product for them and you can respond to their needs. We’re also cognizant of regulation and privacy issues and address those issues with our clients. The two are not mutually exclusive: one can satisfy the regulators and allay customer concerns regarding privacy issues. We work closely with compliance officers and data privacy officers and participate in banking industry presentations and trade shows where these issues are discussed. What do you like most about the work that you do? What I like the most is creating an organization tat is contributing to the success of our clients’ businesses. I also like being able to create an environment where our staff can grow professionally. How do you balance oversight of your business with your active involvement in civic life? My motivation to be in business is the ability to contribute to the community. We try to help our customers succeed and create an environment for our staff to develop their professional aspirations. If you’re successful, the result is time and finances. After a business has met its basic needs, then what? Success has given me the opportunity to be involved in our community and in my native Ghana. Like many developing countries, there aren’t any government services in Africa. I’ve been blessed with my success here, and I feel that it is my obligation to give back. We have helped build schools, improve health care and sponsor kids to go to college. How do you find time to do all of your philanthropic work? When you’re excited about something, you always find time and the motivation to do it. For me, that balances out the business side – being always objective and hard-driving. Sometimes you ask yourself why you do what you do. Money is important, but from my point of view, it also has to make a difference in somebody’s life. You’re making a difference in your customers’ business, in your employees’ lives, and if you have the resources, strive to make a difference in your community.